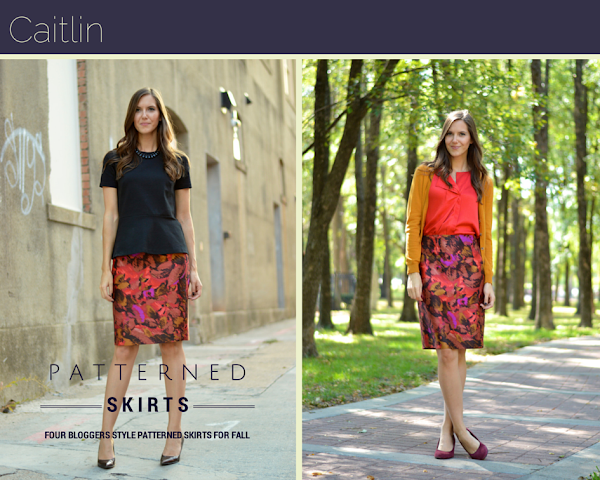 I am so excited to be teaming up with 3 other fabulous bloggers for another edition of a printed skirt 8 ways! You can check out our summer post here. This time, we each styled printed skirts for fall. Make sure you visit Jen, Caitlin, and Erin's posts, too! There is no way I can take credit for this one. Check out my inspiration pin here. I've been wanting to try this out for a while with my similar pieces and I finally got the chance. Love how these two blue and white patterns look together! I love how you mixed polka dots with gingham. Gorgeous look! loved the roundup of you gorgeous ladies and your mix ups! What a great collaboration. Love this and I loved when you guys did this the first time around as well. I own an almost identical skirt but in black with white dots. Need to try it with my B+W Gingham Shirt. Thanks for so much inspiration from this post. Love both looks. What a great roundup of remixes! 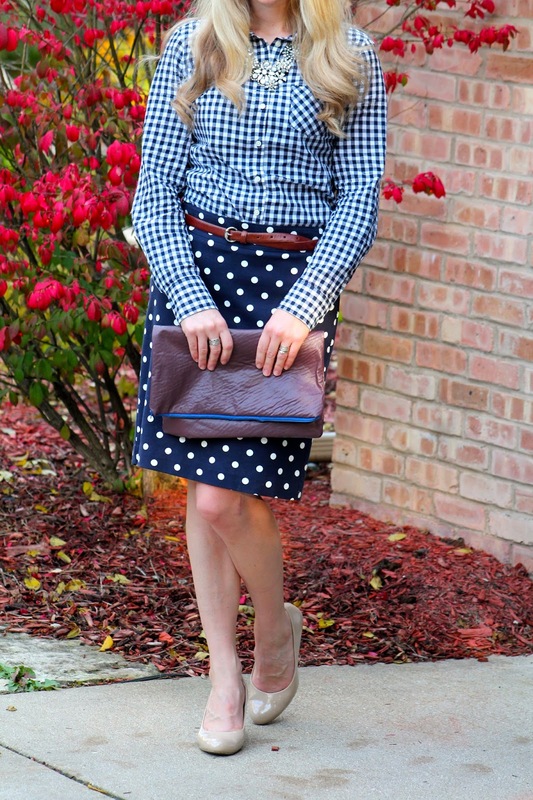 Love both looks but my favorite is the gingham and dots! you all look fabulous, great round-up. I love your polka dot skirt, so classic & adorable!! You all look great. 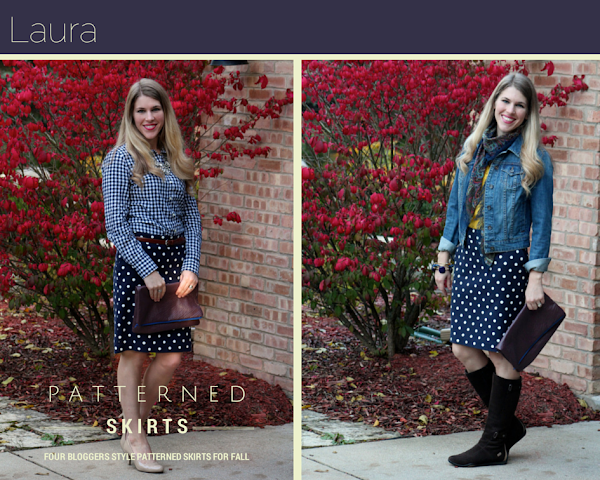 Wow love this post--you all gave me such great inspiration :) Both of your looks are amazing Laura! I love the gingham with polka dots. Would never have thought of it but it looks amazing! Oh I love this post! Seeing all the remixes is so fun and great inspiration. I love the statement necklace with your first look. I love how everyone remixed their outfits! THe colors you chose as well, the mixing of patters, and I love the navy with the foldover burgundy clutch!! I LOVE your remix because I have a really similar skirt. I actually just pinned you :) You are making me ready to be post-baby so I can wear my skirt again soon! 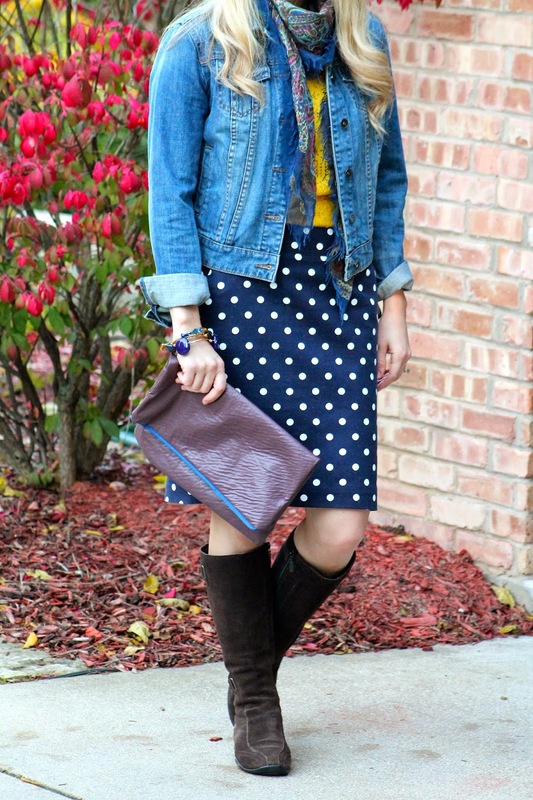 Layering, pattern mix ups and everything! Love it all. Absolutely adore this polka dot skirt!! I love all of these looks!!! What a great post. I so wish I could wear a pencil skirt right now, your polka dots are just too cute!! Wow, I love this post, as well as all four beautiful and creative ladies! My eyes are fixed on the two Gingham shirts. Laura, it's very creative of you mixing the Gingham with polka dots and the whole outfit came out outstanding. 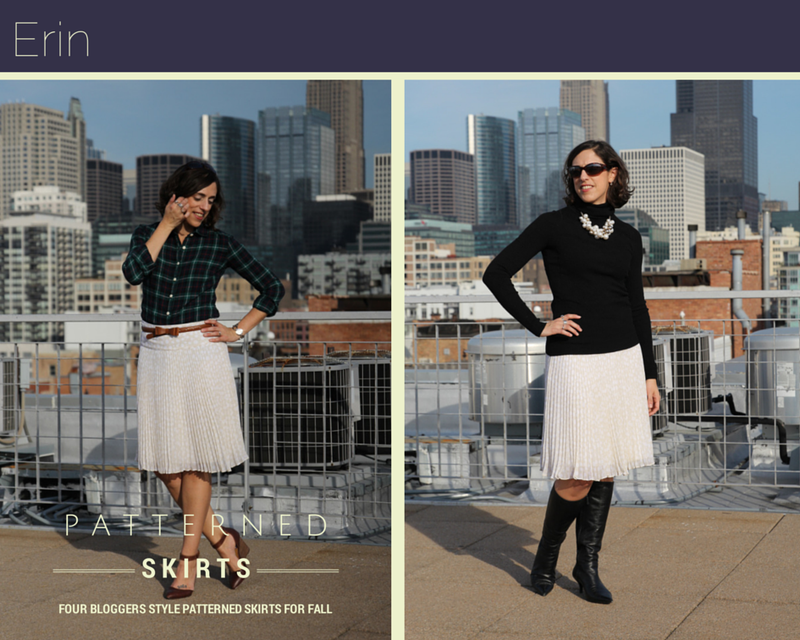 Two thumbs' up for Erin's mix of Gingham with a soft white skirt too. Love all the style inspiration. What a fun post! 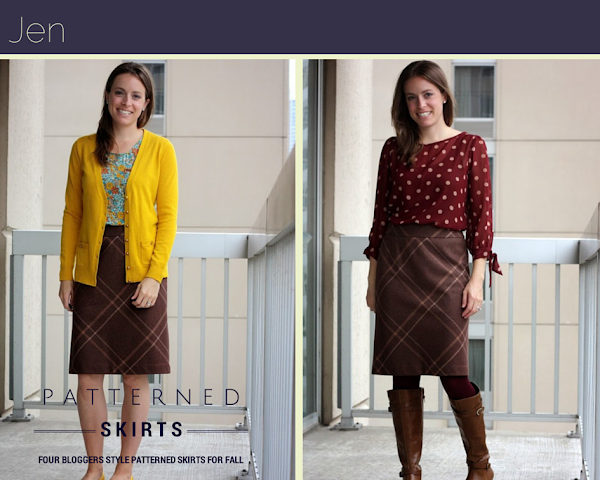 So many great skirt. I love your first outfit. Aw super great post! I always love remixing outfits from day-night, summer-winter, etc. Yours is a lot of fun because it goes from weekday work day to casual weekend! These are some nice looks. All perfect for fall. I really like the pattern mixing! I would never have thought to put those two patterns together but it works really well and looks great on you! All great looks! I am such a sucker for polka dots and love it paired with gingham. P.S. Hope to see you tomorrow for TBT Fashion linkup. Ah man, I am so excited about this post! I have the exact same polka dot skirt, so I will definitely be using this post for future inspiration. You are so cute in this outfit. I really love the little hint of yellow that peaks out from your scarf and denim jacket. Yellow and navy works so great together. That is such a fun skirt, too... I love polka dots! I love skirts and you polka dot one is one of my faves, cute! 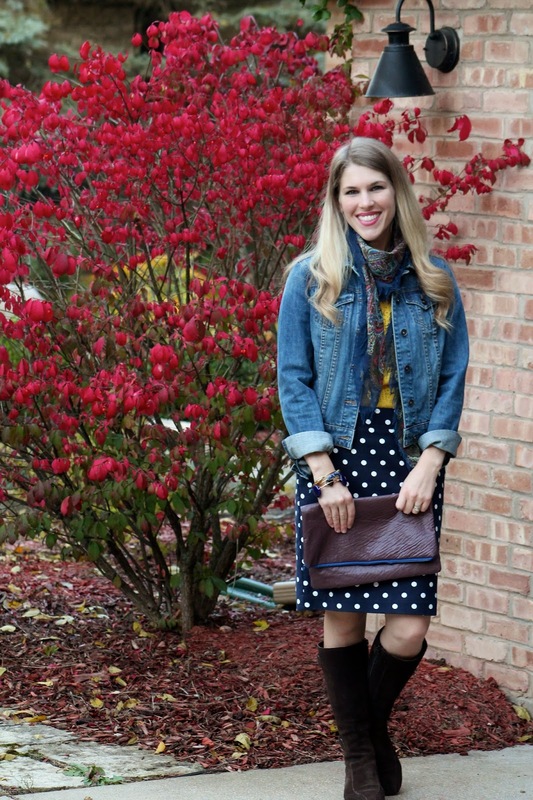 Adorable polka dot skirt! It looks so great with the gingham and I would have never have thought of it. Terrific collaborative post!